Here are some of Kathy Sdao’s articles on training various animals, from walruses to dogs to primates, and some articles about Kathy. Enjoy! All rights reserved. Please ask Kathy before reproducing in any way. Please link to the articles rather than copying content to your site. Thank you. • Are you Clicker Training or Training with a Clicker? 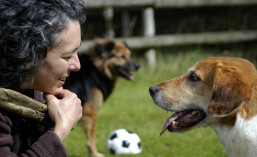 • KUOW radio interview 4/6/07, Is There a Right Way to Train Your Pet?